The New Jersey Devils have landed college hockey's top player by agreeing to sign defenceman Will Butcher to a two-year, $1.85 million US contract. The New Jersey Devils continued stockpiling young talent this off-season by landing college hockey's top player, Will Butcher. The University of Denver defenceman agreed to a two-year, $1.85 million US contract with New Jersey on Sunday after spending much of the past two weeks meeting with nearly a dozen NHL teams. In also considering teams such as Buffalo and the expansion Vegas Golden Knights, Butcher's decision came down to fit rather than contract terms because rookie deals are capped. "This continues to represent what we want to do as a team: bring in talented individuals, invest in their talent and develop them as we progress," general manager Ray Shero said. 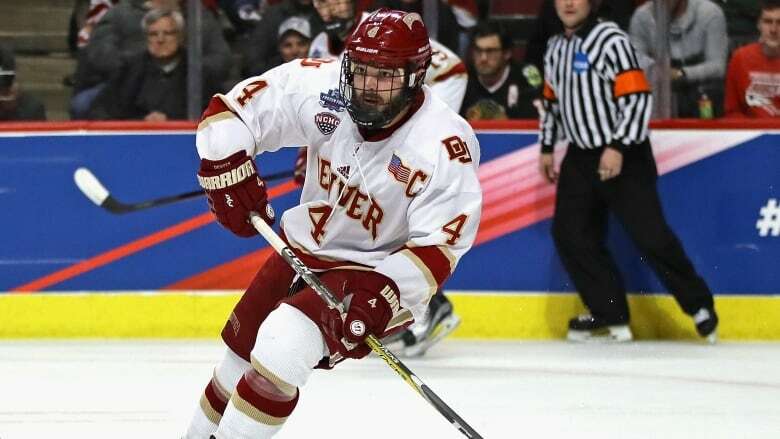 Aside from becoming just the seventh defenceman to win the Hobey Baker Award, the 22-year-old also led Denver to win a national championship in April. He joins a Devils team that is rebuilding through youth. New Jersey won the draft lottery and selected Swiss-born centre Nico Hischier with the No. 1 pick in late June. A few weeks later, the Devils acquired 26-year-old play-making forward Marcus Johannson in a trade with Washington. Last summer, Harvard forward Jimmy Vesey turned down contract offers from Nashville and Buffalo before signing with the New York Rangers for whom he had 16 goals and 27 points in 80 games. Nashville drafted Vesey and traded his rights to the Sabres once it became clear he wasn't going to sign with the Predators.